Looking for information? Do you want to know where to vote, who your alderman is, what day your trash is picked up or what school district you live in? Click here to find the information. Decker is a graduate of St. Ambrose University in Davenport, Iowa with a B.A. in Criminal Justice, and a graduate of the FBI National Academy, Quantico, Virginia, and the National Crime Prevention Institute at the University of Louisville and the Iowa Law Enforcement Academy. He is Past President and current member of the Bettendorf Rotary Club, Vice Chair for the Board of Medic Ambulance Corporation, serves on the Board of Directors of the Illowa Boy Scout Council, he serves as Chairperson for the Board of the First Tee of the Quad Cities, the Chairperson of the Quad City Health Initiative, the Chairperson of the Quad City Local Emergency Planning Council and is a member of the Board of Directors for the Center for Active Seniors (CASI), and is a Past Volunteer Chairman of the John Deere Classic PGA Golf Tournament and Past President of the Board of Directors and current member of the Iowa City Managers' Association. Decker has been the Bettendorf City Administrator since 1990. He also served the City as Chief of Police from 1986 through 1990 and prior to that held positions of Detective Sergeant, Detective, and Patrolman and started his career with the city in 1975. Decker is married with two adult children. He and his wife, Jayne, reside in Bettendorf. The Community Development Department oversees the functions of the Planning and Building Inspection divisions. Your Business Can Be Anywhere!! invests city funds and provides accounting and data processing support citywide. The Legal Department cannot provide advice or representation concerning personal legal issues. The Department is composed of a full-time city attorney, and a part-time assistant. The City Attorney is Christopher Curran. Mr. Curran was appointed to his post in July 2017 and his office is located in City Hall at 1609 State Street. The Assistant City Attorney is Rex Ridenour. Mr. Ridenour is in private practice and his office is located at 111 E. 3rd Street, Suite 700, Davenport, IA 52801. His telephone number is (563) 324-1971. Mr. Ridenour is primarily responsible for prosecuting municipal code violations, but also serves as the City's legal advisor in the absence of the City Attorney. If you have a speeding ticket, other traffic citation, or municipal infraction, and wish to discuss the ticket or discuss plea bargaining of the matter, you should enter a plea of not guilty at the time listed on the ticket. A file will be generated and sent to the Assistant City Attorney only after a not guilty plea is entered. Mr. Ridenour will not be in a position to discuss the particulars of any citation until after a not guilty plea is on file. Additionally, the City Attorney serves as the staff liaison to the Human Rights Commission. If you have a complaint which you wish to file with the Human Rights Commission, the process begins here. of the Bettendorf Public Library. To provide recreational opportunities that enrich the quality of life for all. Frozen Landing Family Ice Rink is located at Middle Road and 23rd Street and is open to all ages and ability levels. There is no charge to skate. Skate rentals are available for $2.00 for both children and adults. Concessions will be available for purchase. PLEASE NOTE, WE ARE ONLY ABLE TO ACCEPT CASH OR CHECKS AT FROZEN LANDING. The rink may not be open if raining, snow accumulation of 2 inches or more (until the rink is cleared), if temperatures are above 50 degrees, 5 degrees or below, or if the wind chill is -15 degrees. Please call 563-549-0587 to see if the ice rink is open. Ice hockey is not permitted at any time. Hockey skates may be used, but hockey sticks and pucks are not allowed. Mondays: 1:30 - 9:00 p.m.
Fridays: 3:00 - 10:00 p.m.
Saturdays: 10:00 a.m. - 10:00 p.m.
Sundays: Noon - 6:00 p.m.
Times are dependent on weather conditions. Interested in DekHockey at Crow Creek Park? Trying to contact the Food Pantry at the Community Center? Their phone number is 344-4126. The address is 2204 Grant Street. They are there Monday, Wednesday and Friday, 9-11 am, and Tuesday evening 6:30-8:30pm. You must be a Bettendorf Resident to use their services. Looking for information about Duck Creek Park? Although very close to Bettendorf, Duck Creek Park is a Davenport Park. Please call Davenport Parks and Recreation at 326-7812. Looking for the Bettendorf Farmers Market? Thank you for visiting our web page and finding out more about our police department. We offer our community one of the best examples of what a local law enforcement agency should strive to be, continually evolving to maintain the highest standards of service. The men and women of our department are some of the most professional, well trained, well educated, and most dedicated officers you will ever find that are committed to keeping our community safe and serving the citizens. We provide many services outside the traditional roles of law enforcement and Bettendorf is the only Police Department in the State of Iowa with a police social worker on staff. The philosophy of the Bettendorf Police Department continues to be focused on community oriented policing and establishing relationships in the community with citizens, community leaders, schools, youth, social service providers, and other law enforcement agencies at the local, county, state, and federal levels. We acknowledge that collaboration with all agencies is imperative if we are going to be successful in our mission. If you ever see something that is suspicious, out of place, or out of the ordinary please do not hesitate to call 911 when the incident is occurring. “You are not bothering us.” We would rather be notified right away and respond to discover that it was nothing than not be called at all, later to find a crime had been committed. Nobody knows your neighborhood better than those living or working there. We need your cooperation, help, and support as we cannot do this alone. I am honored and privileged to serve this community and if you ever have a question or concern please do not hesitate to call me at 563-344-4020 or email me at kkimball@bettendorf.org as we want to be as transparent as possible. Please enjoy our web site and send us your comments. Help us keep Bettendorf the Midwest's premier city to enjoy life and raise a family. Always stay close to your police department, and thank you. To lookup the Garbage and Recycling information for your address, please click on the green button above. The Solid Waste program encompasses collection and disposal of household garbage, recyclable items, yard waste, bulky waste and electronic waste. For more details on each Point of Interest, click on the item on left side of this page. Thanks! Please note: Beginning in 2016, the City will provide collection services on Martin Luther King Jr. Day and Presidents Day. This is a change from previous years. 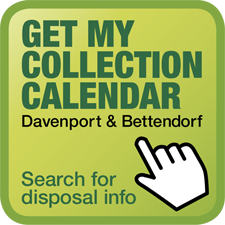 If your collection falls on one of these days, please set out your items at your collection location no later than 7 a.m.
1. All garbage must be placed in the cart with the lid closed. 2. The City recommends bagging all garbage before placing it in the cart. 3. To keep costs down, cart placement is key! 4. Each extra bag of garbage must have a $3.00 sticker affixed. Place the bag on top of cart. If you have old U.S. flags to dispose of they should be taken to the VFW on State Street, just west of Grace Marina. They have an old mailbox that they are deposited in. This is a program that addresses the quantity and quality of runoff from rainfall events throughout the City. Historically, the City has been concerned only with managing the quantity of rainfall runoff that occurs when rain lands on impervious surfaces, such as roofs, parking areas and driveways. Recently, the City has been required to address the quality of the water in the runoff. This is the result of a mandate from the Federal EPA through the Iowa Department of Natural Resources (IDNR). The City has been issued a permit by the IDNR to discharge stormwater. This is similar to a permit for a waste water pollution control plant. In the past, storm sewer planning concentrated on flood control. Modern storm sewer system management takes a total water resources management point of view and pays significant attention to pollution prevention. Most people think storm sewer runoff is a relatively harmless, natural occurrence and do not realize it pollutes natural resources such as creeks and rivers. Yards, garages and even homes can become flooded. How will the City address the problems? Because runoff from City streets is often involved, and many of the problems are too large for an individual to handle, the city has a responsibility to its citizens to address the issues. In 2000, Missman, Stanley & Associates prepared a Comprehensive Storm Water study on all 14 of the city's drainage ways. This study included future Capital Improvement Projects. The City of Bettendorf's Stormwater Section will be the organization to implement this comprehensive plan. Efforts are focused on improving surface water quality which will in turn improve the quality of drinking water, increase viability for fish and decrease flooding. The plan includes the repair and cleaning of roadside pipes and ditches, replacing small culverts with larger ones and maintaining the system on a regular basis. Routine inspections are performed during dry weather to detect and address illicit discharges. Search by address. Do not enter the street suffix (ave, st, etc...) NOTE: If you live in a multi-family establishment, please contact your landlord. The monthly charge needs to be multiplied by 3 for quarterly billing. Also add a $4 bill charge for quarterly billing. BE IN THE KNOW WHEN YOU ARE ON THE GO! Track buses on the route in real time and know when it will arrive at your location. See what routes connect at transit hub/transfer locations. Find out what time connecting buses will arrive. Receive Rider Alerts and other important notifications. The TransLoc Rider App can be downloaded for free on the App Store or on Google Play. Don't have a smart phone? No problem! You can view our real-time interactive map via your desktop. Want to plan a trip utilizing buses in the Quad Cities? Go to www.gogreenmetro.com because they offer a convenient link to Google's "Trip Planner" service. Bi-State, QC Transit Agencies Launch Rideshare Site. To visit QC Rideshare website Click here. Bettendorf is committed to providing safe, reliable, courteous, and accessible services to all of our customers. To ensure equality and fairness, we are committed to making reasonable modifications to our policies, practices and procedures to avoid discrimination and ensure programs and services are accessible to individuals with disabilities. Requests for modifications can be made by calling us at (309)788-3360. In compliance with the Americans with Disabilities Act of 1990, Bettendorf Transit operates all of its programs and provides public transportation services without regard to disability. Anyone who believes they have been subject to an unlawful discriminatory practice by Bettendorf Transit due to a disability has the right to file an ADA complaint. ADA complaints must be filed in writing within 180 days from the date of the alleged discrimination incident. Click to Download Bettendorf's Title VI and ADA Complaint Form. Bettendorf Transit is committed to ensuring that no person is excluded from participation in, or denied the benefits of its services on the basis of race, color, or national origin as protected by Title VI of the Civil Rights Act of 1964, as amended ("Title VI"). To request more information regarding Title VI you may contact the Human Resources Director at City Hall, located at 1609 State Street, Bettendorf, IA 52722, or phone (563)344-4009. If you believe you have been subjected to discrimination under Title VI, you may file a written complaint with the City of Bettendorf at the City Clerk's Office, located at 1609 State Street, Bettendorf, IA 52722. In accordance with the requirements of the U.S. Department of Transportation, as set forth in 49 C.F.R. 26, as amended, the City of Bettendorf (Bettendorf Transit) hereby announces its Disadvantage Business Enterprise (DBE) goal of 0.00% for applicable procurement and contract activities utilizing Federal Transit Administration (FTA) funds from FFY2019-2021. Questions regarding the DBE Goal should be directed to Mark Garrow, Transit/Garage Manager, 4403 Devils Glen Rd, Bettendorf, Iowa, 52722 or via email at mgarrow@bettendorf.org. Mayor Gallagher was raised in Bettendorf and graduated from Bettendorf High School in 1987. He received a BA in Communication Studies and Psychology from the University of Iowa in 1991. He received a Juris Doctorate Degree from Marquette Law School in 1994. He returned to Bettendorf to practice law and raise his family in 1996. He is the proud father of two children, Jackson and Allysa. He has served as Chairperson of the Board of the Quad Cities Chamber of Commerce Federation, Bettendorf Chamber of Commerce, Bettendorf Civil Service Commission, Bettendorf Schools Foundation, the Iowa Quad Cities Rotary Club and Better Business and Education Partnership. 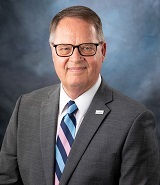 Bob serves on the Board of Directors of the Eastern Iowa Community College Foundation and is a member of the Quad Cities Chamber Bettendorf Area Council. He is a volunteer coach for the youth of our community. Bob has been recognized as an outstanding leader and community servant. In 2008 he was awarded the Sheldon Sitrick leadership Award for Extraordinary Leadership and Distinguished Service in our community. He received recognition as a Quad City Area Leader Under 40 in 2008 and was Volunteer of the Year for the Bettendorf Chamber of Commerce in 2004. As a small business owner, community volunteer and proud father of two wonderful children, Bob is dedicated to helping Bettendorf reach its full potential. His vision for Bettendorf includes growing the City's already competitive business environment while preserving the services and amenities Bettendorf Residents currently enjoy. Group photo not available at this time. Affirming the city's mission to make Bettendorf a premiere place to live and work, and recognizing the diversity of our community, our mission is to foster a city free of discrimination through education, mediation, advocacy, compliance, and enforcement of our Civil Rights Code. 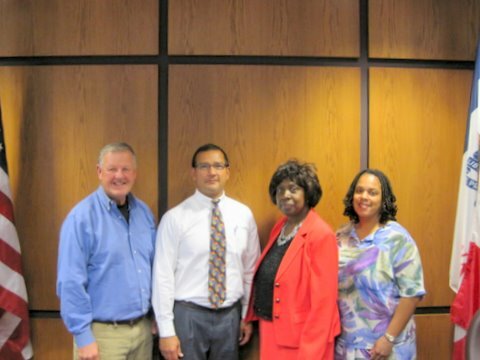 (left to right) Tim Wilkinson, Miguel Flores, Glinder Walker, Carolyn Merrill. Not pictured: Mike Senneff, Nanchi Umennachi. City Council Members do not have set office hours at City Hall, but do check and stop in frequently for messages and correspondence.